Tell us more about the production of this beer and why you think it is deserving of the coveted title? "This is one of our newest beers in the Classics series we produce. The goal of these series of beers is to take classic styles and give them a Northwest touch. This is a year round beer that is loaded with Chinook and Amarillo hops! The beer gets hops at various stages including aggressive dry hopping and use of our hop back. It is approachable, not overly bitter, but has a wonderful moderate bitterness and full of hop flavour and aroma. We believe this is the best Pale Ale out there, because it is aggressive and hop forward but approachable at the same time. Give us a brief history of the Fish Brewing Company and an overview of your award-winning portfolio. Fish was founded in 1993. The company’s original founder called on the citizens of Olympia to pledge their time, talent, and capital to help open the doors of this establishment. The growth from that faithful day has been exponential. In our portfolio we produce Fish Tale Ales (classics and organic ales), Leavenworth Biers (German inspired beers with a northwest twist), and Spire Mountain Cider (northwest style cider). Our innovation, dedication to quality, and pledge to environmental sustainability have made these brands a success. In addition to our major lines we also produce many one off unique beers and barrel aged beers and ciders. What do you think differentiates your products from others on the market? Our process, our ingredients, our talented brewing staff, and our company culture. We have fined tuned our processes to still produce many artisanal products that are crafted in small batches, but we are also able to reproduce our beers in a consistent matter that focuses on quality. For our ingredients, our thoughts are always think global, source local. This means we develop recipes with the finest ingredients from the globe. We strive to use these ingredients from local producers in Washington and in the Northwest to work closely with our suppliers on quality, and have the freshest ingredients possible. We have one, if not the most, talented teams in all of brewing. From inception to consumption our goal is to create a wonderful beer experience for our consumers. Having a team that focuses on that goal that is knowledgeable and dedicated makes all the difference in the world. Our culture focuses on freshness of our products and environmental sustainability. These efforts help the community we are in and make sure that we deliver the best product possible and are good stewards of our environment. In what regions, countries, markets are your products available and who distributes them? Are they available in both the on- and off-trade? Our products are located all over the United States. We are currently in 25 States that span Florida to Hawaii and Alaska. We also distribute to Canada and Japan. The northwest is a big part of our home and that is where you will find most of our products. We use many different wholesalers and the Great Artisan Beverage Network to get our products to stores and consumers (these include: Odom, Sound Beverage, Stein, General Distributors, Bigfoot, and of our local distributor Marine View Beverages). Our product is available in many outlets that serve alcoholic libations throughout northwestern US. We produce over 21,000 barrels of beer per year and 6,000 BBLs of cider (a barrel is 31 US gallons), but we are still a small-sized company. We have 14 production employees, four support staff, five sales and marketing employees, and our CEO. The labels and packaging designs of your brands make them instantly recognisable – explain a bit about the branding of your products. Our branding for each line we create plays a key part of our story that we want consumers to know and understand about our products. Fish Tale Ales represents that the 'tales' of a fisherman. We have often used the slogan “you should have tasted the one that got away”. Our labels in this series of beer will depict scenes and moments in our home area. So, our branding is more than a great label, it’s a story about our heritage, and a homage to the great northwest. We primarily use a single local designer who works closely with our CEO and marketing team to promote our branding. How important do you think the packaging / label design is to the success of a beer and why? We believe this will be a key part of our success. We stand by the mantra that the liquid in the bottle is what matters. However, we need consumers to find Fish Brewing Company’s beers and have the brand be recognisable. 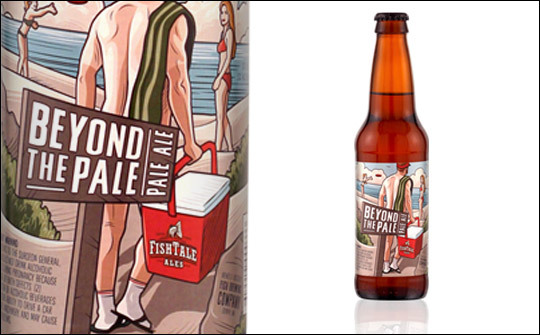 A good label and package will let people know this is a product Fish Brewing produces. We produce over 35 beer products a year, and a good branding message, good packaging translates the continuity of creativity and innovations to all of our products. Growth is a crucial part of our success. We have been fortunate to have this great recognition for our products. We are finally at a point in our journey where we are looking to add other distributors, so more people on the United States, and the World will have the opportunity to try our amazing products. Our Pale Ale and classics is where we will see a lot of our growth. Also, over the next two years we are focusing on canned packaging, and development of new and wonderful products for the market (an unbelievable India pale lager, and a great dry cider are next on the list). As we build out our new product offerings and increase distribution we see 50%+ growth over the next two years! As I mentioned, our new India Pale Lager from our Leavenworth Line will be a game changer for us! We also have new ciders, a new IPA that will match the quality and depth of flavour as our Beyond the Pale, and a new reserve line of beers including an Imperial Stout aged in red wine and bourbon barrels -please stay tuned!